They find and use rituals, that is, the repeated use of personally meaningful rhythmic activities with every contraction. While women draw heavily on the coping measures they learned in childbirth class, those who cope well usually do more than that; they discover their own rituals spontaneously in active labor. If disturbed in their ritual or prevented from doing the things they have found to be helpful, laboring women may become upset and stressed. Women are most likely to find their own coping style when they feel safe and supported, and are free from restrictions on their mobility and their vocal sounds and are also free from disturbances to their concentration, such as other people talking to them or doing procedures on them during contractions. One woman felt safe and cared for when her mother brushed her long, straight hair rhythmically during the contractions. Another rocked in a rocking chair in rhythm with her own pattern of breathing. Another wanted her partner to rub her lower leg lightly up and down in time with her breathing. Another wanted her partner to count her breaths out loud and point out to her when she was beyond the number of breaths that meant the halfway point in the contraction. Another dealt with her back pain by leaning on the bathroom sink, swaying rhythmically from side and moaning while her partner pressed on her low back. Another, who had rowed crew in high school, used a visualization in conjunction with her breathing pattern: each breath represented a stroke of her oar, helping her to “glide smoothly” through the contraction. Another let her breathing follow the rhythm of her partner’s hand moving up and down (“conducting”); she focused entirely on the partner’s ring with its blue stone as her guide. Once a woman finds a ritual, she depends on it for many contractions. Changing the ritual or disturbing it throws her off. Most women change their ritual from time to time in labor, when a change of pace seems necessary. 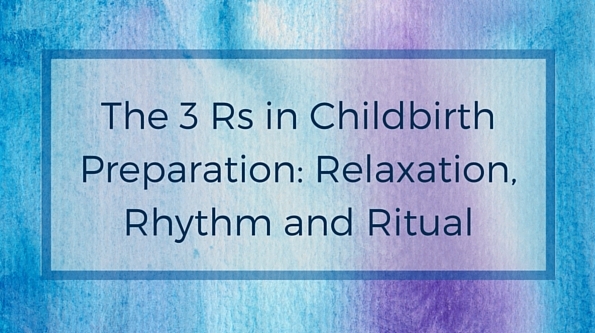 Childbirth educators who want to distill their teaching to cover the most meaningful ways of coping with the stress and pain of labor, might wish to incorporate the concept of the 3 R’s in their childbirth preparation.